The R-PLEX Mouse Resistin Antibody Set includes a matched capture and detection antibody pair and calibrator for the quick and easy measurement of Resistin in biological samples. R-PLEX products leverage MSD’s electrochemiluminescence technology for better sensitivity and a larger dynamic range than traditional ELISAs. R-PLEX matched antibody sets enable the development of singleplex and multiplex immunoassays. Individual assays may be developed using MSD avidin- or streptavidin-coated plates. Custom multiplex assays with any combination of R-PLEX analytes, as well as R-PLEX plus U-PLEX analytes, can be developed on U-PLEX MULTI-SPOT plates. To learn more about the advantages of R-PLEX products click here. 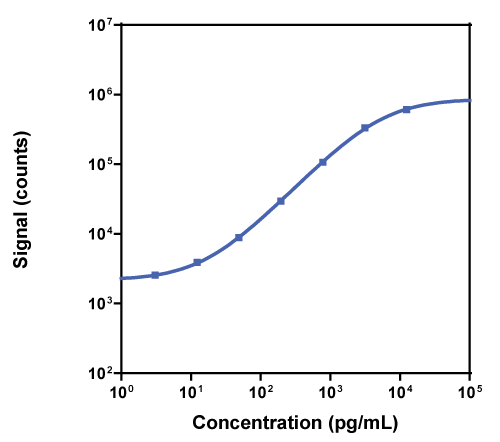 Calibration curve for the R-PLEX Mouse Resistin Antibody Set was assessed and representative data are presented below. Description - Resistin (RETN, ADSF, FIZZ3, RETN1, RSTN, XCP1) is a peptide hormone derived from adipocytes and immune cells. Serum resistin levels are elevated in diet-induced models of diabetes and thus, resistin might link obesity with diabetes. In humans, resistin is expressed in inflammatory cells, leukocytes, and macrophages and can induce production of IL-6 and TNF-α. Similarly, resistin levels are increased in joints inflamed with rheumatoid arthritis (RA). Note: This antibody set also detects rat resistin. Rat serum and rat plasma were tested using a 5-fold dilution. Characterization of a multiplex, 12-biomarker test for rheumatoid arthritis. Performance of a multi-biomarker score measuring rheumatoid arthritis disease activity in the CAMERA tight control study. Validation of a novel multi-biomarker test to assess rheumatoid arthritis disease activity.